Philadelphia-based Hop Along create a kind of restless, emotional indie-folk-rock, that all comes together thanks to the distinctive voice of frontwoman and primary songwriter Frances Quinlan. Quinlan also co-produced the recent release by fellow Philly band Thin Lips, who join them on this tour. With music by Grammy-loaded pop star Sara Bareilles, and book by Hollywood screenwriter Jessie Nelson, the main ingredients in the musical Waitress come from a bit outside the typical Broadway box. And audiences seem to think it works, as the show has been a hit in New York and on the road, now making its Los Angeles premiere. Performances continue through August 26. To celebrate the first full growing season at Redbird’s on-premises garden, bar director Tobin Shea has created a special of menu of cocktails he’s named “The Plain Truth About the Best Seeds.” The name is a nod to vintage seed packets, and the theme is all about locally-grown ingredients. 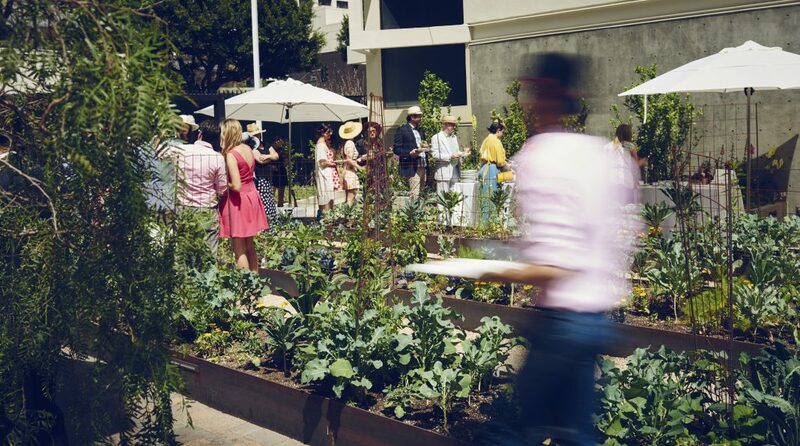 Redbird debuts the drinks at this party in the very garden that inspired it all. Queer Latinx representation both on screen and behind the scenes will be discussed at this lively roundtable taking place at LA Plaza de Cultura y Artes. A particular focus for the conversation, hosted by Mario Novoa and Cynthia Gonzales and featuring filmmakers, festival directors, and other cinema leaders, will be how to get work by underrepresented creators in front of audiences, via theatrical distribution, film festivals, social media, and other means. End the week with a retro dance party at Arts District venue Resident. DJs Ultragrrl and Colin Johnson will spin throwback tunes from the likes of Depeche Mode, Joy Division, Blondie, David Bowie, and the Smiths. Entry is free with online RSVP—just don’t forget the eyeliner!